Apple reported results for its third quarter on July 24 and much has been made of the “disappointing” 26 million iPhones sold, a mere 28 percent growth over the same period last year. Here is another data point sure to encourage the ihaters — in July, the iPhone wasn’t the best selling smartphone. And likely won’t be in August, either. Quoting a Krusell market report, Taiwan Economic News Service claims that Samsung’s Galaxy S3 is the world’s best selling smartphone with Apple’s dynamic iPhone 4/4S duo following in second. 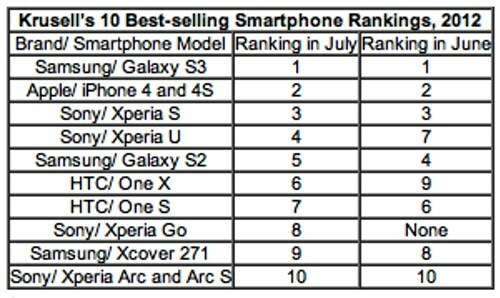 Moreover, Krusell expects Samsung’s hot-selling handset to keep the top spot through August, as well. For what it’s worth, Krusell doesn’t offer unit volume figures to back up its claim. More tellingly, however, is the fact that the case maker lists the Sony Experia S as the world’s number three seller and their top 10 also includes three other Xperia smartphones. Though Sony sells more than a few devices, perhaps nobody other than Krusell thinks the Xperia anything deserves four spots in the top 10. What’s that all about then? Obviously, it’s all about Krusell, which prominently advertises its “Made for Xperia” product line online — i.e. the data is, at best, skewed. Though Samsung handily sells more phones than anyone on the planet, whatever iPhone is newest has always held onto the top-selling individual device spot. If you choose to believe Krusell, which isn’t an impartial observer, then Apple has been pushed out of the cat bird seat. Even though it’s unlikely that this data can be trusted, it’s clear that currently Samsung produce the world’s best selling smartphone, but with the impending release of Apple’s iPhone 5 in under a month, that could change very quickly. Do you believe Krussel’s numbers? What do you think the world’s best selling smartphone is? Share your thoughts in the comments below.